Technically speaking, this is a “back to school” post, though it’s hard not to be a little wry about returning to school when one has done it not once, but four times over. My first trip back to school was when I started blogging–at the time, I got my holistic nutrition training via a distance program while working, and I also starting to explore the groundwork of an R.D. with a few introductory nutrition classes. My second and most tumultuous journey back to school was my pre-med, post-bacc, which lasted nearly four years (if you’ve just started reading, I’ve written about the post-bacc here and here). My third trip back started last fall, as I was reconfiguring my future, figuring out what would fill the void that had been left when my plan to practice medicine evaporated. It suddenly felt so clear that deepening my nutrition work was what I should have been doing all along. And so, in spite of some post-post-bacc fatigue, I set about retaking the classes that I’d struggled in, clearing up the last of my R.D.-specific pre-reqs, and applying to programs here in New York. Tomorrow, I’ll be beginning a new chapter as an R.D. student at Columbia. I feel so grateful and fortunate to be finally settled on this path. I feel a little trepidation, too. The last year has been such a gift, a chance to dive back into writing, blogging, and counseling with purpose and pleasure. I’m not necessarily made for student life. Even in college, I couldn’t help feeling a certain resistance to the confines of a campus, a desire to be out in the world and working. But for all of my proclamations about how student life never was/is for me, I’ve spent the better part of the last six years as a student, either full or part time. And this wouldn’t be the case were I not certain that this education I’m getting–a more thorough understanding of nutrition science and how it works–is precious. The nice thing about this trip back to school is that it feels nothing like my post-bacc. For one thing, it feels solidly and indisputably “right.” There was always a part of me that worried, even before the post-bacc started, that I medicine was too far afield for me. Nutrition work feels so natural and enjoyable that I think I used to take it for granted. Not anymore. What a blessing it is to be returning to school with a sense of certainty that I’m studying what I should be studying, for all of the right reasons. I also made the decision last spring to complete the R.D. program part time. This means that it’ll be about three years of course work, not including my D.I. (dietetic internship). It sounds like a long time, but no matter. I’ve been in school for a long time already. And the nice thing about going back part time is that I won’t have the sense, as I did during my post-bacc, that I’ve surrendered my entire existence in the pursuit of one single goal. I’ll still be doing my counseling work, writing, blogging, living. I hope that my life will feel multifaceted and integrated at the same time–a combination of work I love and an education that serves and deepens the work. Finally, and perhaps most importantly, I’m approaching this return to academic life with a sense of humor. This isn’t to say that I don’t intend to take my studies seriously; of course I do. But if my post-bacc gifted me with anything, it was a capacity to regard my own missteps without complete dismay. I am no longer a nineteen year old who must get A’s in everything in order to feel legitimate and worthy. Life is too short. I will work hard, I will apply myself with rigor, and I will enjoy the material. But there will be things I don’t grasp easily, and mistakes will be made. Life will go on, and I’ll cherish the learning process anyway. Mistakes and messiness are, I guess, the segue way into today’s recipe. I hope to sustain my culinary adventures through the upcoming semester, but I know that, once school is in full swing, weekday baking projects will probably be fewer and farther between. The focus will be on batch cooking, planning dinners for the busy weeks ahead, and fueling myself for the combination of work + study. So, this week, eyeing some beautiful plums at the farmer’s market, I decided to bake a crisp, one last little farewell to August and my summer-long reprieve from work/school juggling. Here’s the good news: the crisp is delicious. And for something that I thought of as a “project,” it’s actually super simple to create. The bad news is that this crisp, like most crisps, bubbles and spatters, and so the finished project was a little messy. At first I was ready to ban it from the blog on the grounds that it wasn’t pretty or neat enough. 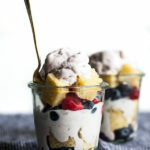 But who am I to talk about embracing missteps and messiness and then overlook a perfectly wonderful dessert because it’s not entirely photogenic? Anyway, as Steven pointed out, the bubbly messiness of crisps is part of their charm. So, here is my tasty, messy, and bubbly end of summer plum and blackberry crisp. 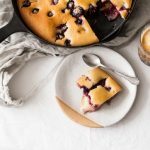 It features a tart, sweet-but-not-too-sweet, brightly purple filling and a delightfully sweet topping. The topping is abundant, because crisp/crumble toppings are the best part. Serve it with a scoop of non-dairy vanilla ice cream for a perfect August/September treat. And then try not to eat leftovers for breakfast. Preheat your oven to 350F. Toss the plums and blackberries together, along with the 3 tablespoons sugar and the 1 tablespoon flour. Place the ⅓ cup sugar, the 1 cup flour, the oats, the salt, and the coconut oil or Earth Balance together in a food processor, along with a tablespoon of water. Pulse until the mixture has formed large crumbs. Add another tablespoon of water if it's too crumbly. When it's all crumbs, you're done. 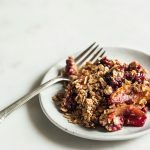 Alternately, you can mix the crumble topping together by rubbing it all together with your fingertips until it has that nice crumb consistency. Lightly oil a deep, 9 inch pie dish or an 8 x 8 or 9 x 9 square baking dish. Place the plums and blackberries in the dish and distribute the crumb topping over them. Bake for 40-60 minutes, or until the filling is very bubbly and the top is browning. Allow the crisp to cool somewhat before serving, so that the filling isn't too runny. Leftovers will keep in an airtight container for up to four days. Of course, crisp is one of those “template”-like recipes that can be customized with plenty of different fillings. If I’m lucky, I’ll be repeating it this fall with pears or apples. I’m excited for all of the classes (after so many years of pre-reqs, it feels exhilarating to be diving into nutrition studies in earnest! ), but particularly about Food Ecology, which is a renowned course in the program. It’ll be fun to report back to you on what I’m learning from time to time. I also plan to share with you some of my strategies for meal prep and planning as a part-time student. This was something I really wanted to do more constructively during my post-bacc, but those years were so chaotic that I never really shared in a way that was helpful. I work with a lot of students and part-time students and busy clients, and I’m increasingly eager to share the strategies I give them here on the blog. So, you can expect more posts on weeknight dinner planning, batch cooking, slow cooking, and the like. As well as some exciting and overdue blog updates, which should be unveiled later this month. On that note, everyone, have a great night. And enjoy the beautifully messy crisp. I know that you of all people understand the humility that comes with being a health science student! I hope that your own path is taking you to interesting places, places in which you’re learning about yourself and about how to take care of others. When you boil pre-health and health studies down to those two primary pursuits, the whole thing feels profoundly worth it, doesn’t it? ps Intrigued by what nutritional ecology might be. . .will look forward to learning about that with you. .
Ah, nutritional ecology is nutrition studies from a global, or ecological perspective. So, according to the syllabus, the topics covered will be food/population problems and food aid, food product development and promotion here and abroad, energy and food relationships, food safety and the changing American diet, organic agriculture and natural food, and biotechnology. A *lot* of rich and provocative material. The teacher of this course, Joan Gussow, is a bit of a legend, and as it turns out, Ginny Messina (whose work I admire very much) was quite influenced by her as she was starting her own nutrition studies. Anyway, I’ll certainly be sharing along the way! Gena, I loved this post soooo much! So happy you’re doing the right thing for you. Looking forward to updates about school and any tips/techniques for planning, etc. That’s one of my biggest downfalls, for sure. And of course, I love this recipe. Planning a trip to the market this Saturday to look for plums. Thanks for all you do! Thanks, Sheri! I have vowed to address planning *many* times over, and this time I’m really determined to put my money where my mouth is. So, stay tuned–and enjoy the crisp! Good luck going back to school Gena! You’ll do wonderfully and are definitely on the right track. I’d be a student (nearly) all my life if I could too. The field of nutrition is always changing, interesting and inspiring. That’s one—of the many— things I love. Good luck and enjoy! Lovely recipe too:) Looking forward to reading your new book out with Food 52! Aw so happy for you Gena, it sounds like things are really falling into place and you’re at a great place life, school, and careerwise. I’ve been following your blog since the beginning and find it inspiring. Thanks for sharing your personal journey with school and work. I’m trying to get into an RD program, came from an arts background and am facing set backs and your stories encourage me to preservere. Best of luck with this semester. It sounds like it will be a great balance and all very fulfilling. I’ve been enjoying your thoughtful comments for as long as you’ve been enjoying the blog! Thanks so much for the kind words. I can’t encourage you strongly enough to persevere with the RD track, if that is what you want. I know it’s humbling and often exasperating to switch gears from a lifetime in the humanities to the hard sciences. But what I can tell you now that I’ve been at it for a long time is that the material really *is* starting to cohere, to resonate, to take shape, and the methodology is truly starting to feel like second nature. It’s a new way of thinking for sure (just like they say law school is), but with patience, it can open up a lot of fascinating material. Be tough, but be gentle on yourself, and I wish you much luck. Many thanks for the kind words, Christine! Crisps are so lovely (I say this still basking in the glow of yesterday’s leftovers!). I constantly read about healthy lifestyles, and try to keep an alkaline ph. (as a result of repeated UTI’s, reflux, etc…to keep from taking any kind of meds, which can destroy my bone density) I have used strictly almond milk for 2 years, but just read that the ingredient, carrageenan, is cancer causing…therefore, we should make our own almond milk. Are you aware of carrageenan and it’s consequences? I also eat lots of raw foods as I know cooking destroys some of the nutrition, so I watch your site for those recipes without sugar and other acidic foods. I had a great desire of becoming a dietitian many years ago, but didn’t know where to start, as I felt most dietitions were not taught true nutririon. Congrats to you and good luck with your adventure of learning more…and for passing it on to us. I am applying for the didactic program this spring at the University of North Dakota so I am still working through my pre-reqs. Nutrition Throughout the Lifecycle has been my favorite class so far, especially the sections on breastfeeding. I had a fantastic professor who made all of the info easy for us to soak up. Good luck with your semester! So glad that you’re enjoying your coursework, Erin, and I love the tip about Nutrition Through the Life Cycle. I actually just switched up fall classes so that it’ll be Human Development instead, but Life Cycle is in a future semester. Can’t wait to explore the class. “Life is too short. I will work hard, I will apply myself with rigor, and I will enjoy the material. But there will be things I don’t grasp easily, and mistakes will be made. Life will go on, and I’ll cherish the learning process anyway.” — I’m going to write this on a post-it note and carry it with me everywhere. Perfect words. And the recipe looks amazing. Keep that post-it close, lady. We back-to-schoolers need it! The mess makes it all the more beautiful. I always say “cook and bake with abandon,” and if that means I make a mess, so be it! This is a beautiful crisp and I love that you used plums and blackberries together. Best of luck to you with your classes!! “Cook and bake with abandon” is a beautiful philosophy, Lauren. Thank you for sharing. Your writing is so honest and beautiful in this post, Gena. It sounds like you’re heading into this new chapter from a great mental place–wise, calm, and ready! It’s gonna be AWESOME Gena. Columbia is a GREAT school. Wishing you well for this new chapter in your life. Hi Gena! I’ve been reading your blog for a while now and wanted to tell you good luck with your new studies! I am starting my MS in nutrition this semester as well after a long time coming. I wasn’t sure whether or not to go the RDN route but now I am really considering it after reading some of your posts. I looked at the ACEND site but didn’t see my school on there so I’m hoping to contact the Counsil and see if I might be eligible as well. I look forward to seeing your meal posts to get some inspiration during this new back to school season! I’m looking forward to making this. Personally, I love when food appears a little messy around the edges – it just calls to be eaten! Dessert very tasty and very nutritious and will be doing and putting in my company by salgadinhos para festa. 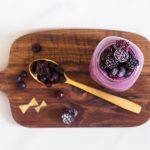 This blackberry crisp is so Instagrammable and adorable! As you know I made it a short while ago and it was lovely! Thx, Gena for sharing!